Card Creator Untamed Scrolls Etched Dies Rebel Rose by Stacey Caron. This Card Creator Untamed Scrolls Etched Die set from Rebel Rose Collection by Stacey Caron includes one insert design and one frame design. Use just the insert die to create an inset pattern into a project. Or nest the frame and insert dies to create an intricate die cut piece. Spellbinders Card Creator brings a simple and unique solution to multiple crafting projects. The work is all done for you, no more measuring required. Simply Choose your design, Assemble your pieces, Refine the details and you're Done! Fits for A2-sized (4.25 x 5.5 inch) cards. 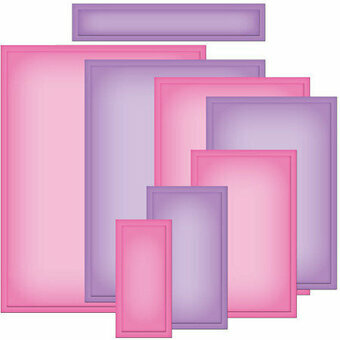 Approximate Size: Insert: 3.90 x 5.15 in., Frame: 4.25 x 5.50 in. Cut, fold, and adhere the flaps to quickly create an envelope sized to perfectly house a standard gift card. This classic design allows you to create an envelope perfect for any gift-giving occasion. The Gift Card Envelope measures 3 1/2" x 2 1/4" when assembled. MFT Die-namics dies are our very own EXCLUSIVE, American made line of steel dies. This "flip card" or "swing card" die has a lot of different uses. The scalloped square part cuts, while the 2 extending straight lines are score line which you align on the fold of your card. With this die, you can create swing cards, tent cards, z-fold cards and a variety of other kinetic cards. The scalloped semi circle measures 3.75" in height. Pair this die with the Bump Card Scalloped Square die set (FRA10009) to give you more options as well as layer pieces that will fit inside the scalloped square. Frantic Stamper Precision Die - Gift Card Corner Holder. Gift cards make gift giving easy.... and with this die, you can make a quick insert to hold a gift card perfectly. We are offering you two versions of gift card holders. Both of our gift card holder dies have a unique feature. The die itself is a bit larger than a standard gift card. The outer edge of the die doesn't cut, but it will emboss a nice place holder for your card. The only part that cuts are the 2 notches that hold your gift card in place. On this version, the notches are in the corners. Also included in this set are the words "a gift". You will need to snip this word die out before use (metal snips work great, followed by a metal file to remove the sharp edge). Our Frantic Stamper Precision Dies work in most consumer table top die cutting machines such as the Cuttlebug, Big Shot, vagabond, Boss Cut, and Grand Calibur. Some dies may require the use of a metal shim depending on your machine. This pop-up surprise is sure to make anyone smile! Adhere this gift card pop-up inside a standard sized greeting card, and tuck the gift card inside the slot to create a pop-up surprise. Scalloped and stitched details make this functional die extra cute! Lawn Cuts custom craft dies are high-quality steel, made in the USA, and are compatible with most die cutting machines! 5 1/2" x 2 5/8". This Graceful Corners One Card Creator Amazing Paper Grace by Becca Feeken Etched Die set would make an awesome addition to your die cutting collection. This collection incorporates the gorgeous classic style that will make your projects shine. Amazing Paper Grace by Becca Feeken for Spellbinders offers the latest designs that brings grace and elegance to any creative project. A wonderful complement to the Card Creator series, the four corners set offers a variety of accents to your corners from corbels to photo corners. Corbels: 2.10 x 1.70 in (2 pcs), Photo Corner: 2.20 x 1.30 in, Romantic Loops: 3.00 x 1.20 in. 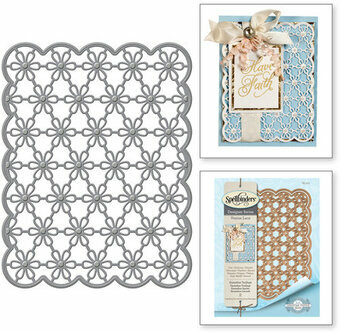 This Graceful Floral Lace Card Creator Amazing Paper Grace by Becca Feeken Etched Die set would make an awesome addition to your die cutting collection. This collection incorporates the gorgeous classic style that will make your projects shine. Amazing Paper Grace by Becca Feeken for Spellbinders offers the latest designs that brings grace and elegance to any creative project. A wonderful complement to the Card Creator series, this two piece set brings a sweet flora motif to the edges of your cards, scrapbook pages, and more! Approximate Size: Pierced Edge: 0.30 x 6.80 in, Flora Lace: 2.20 x 6.85 in. Nellie's Choice - Magic Card Die - Star. Use these magic card dies to design a card with dimension. Simple instructions are included to use these dies to create a card that reveals layers as it opens. Includes 7 dies.Size: Largest 2.75" x 6.75" Smallest 0.75" x 0.75". Inspired by nature, Stacey Caron's gorgeous new Botanical designs are a beautiful fun floral twist to her classic style. 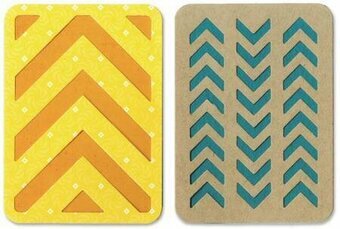 These designs will be an instant classic and favorite with crafters and maker alike. Spellbinders Nestabilities Card Creator brings a simple and unique solution to multiple crafting projects. The work is all done for you, no more measuring required. Simply Choose your design, Assemble your pieces, Refine the details and you're Done! Fits for 5 x 7 in. sized cards. An elegant ensemble created by Becca Feeken, known for her beautifully crafted cards. Filigree Delight is a reflection of her style. Use the wonderful filigree frame by itself centered with its embossed center or nest with the oval to create an open frame. A 'must have' in any card maker's collection! Spellbinders Nestabilities Card Creator dies brings simple and unique solution to multiple crafting projects. The work is all done for you, no more measuring required. Simply... Choose your design, Assemble your pieces, Refine the details and you're Done! Approximate Die Template Sizes: Accent: 1 3/4" x 3/4", Corner: 2 1/4" x 2 3/8", Tag: 3 1/2" x 1 5/8", Oval: 3 3/4" x 2 7/8", Frame: 3 7/8" x 5 1/8". Beautiful intricate cut corners creating a beautiful shape in the center. Use alone with its embossed center or nest with Die #3 to create an open frame. 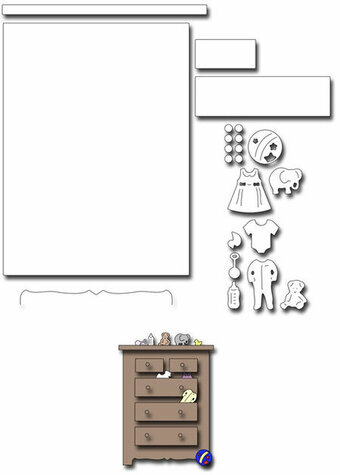 A beautiful addition to your A2 sized CARD Creator collection. Spellbinders Nestabilities Card Creator brings a simple and unique solution to multiple crafting projects. The work is all done for you, no more measuring required. Simply Choose your design, Assemble your pieces, Refine the details and you're Done! Approximate Die Template Sizes: 1: 1 1/4" x 2 1/2", 2: 3 7/8" x 3/4", 3: 4 1/4" x 3 1/4", 4: 3 7/8" x 5 1/8". Jolly Ole St Nick has never looked at you so closely. 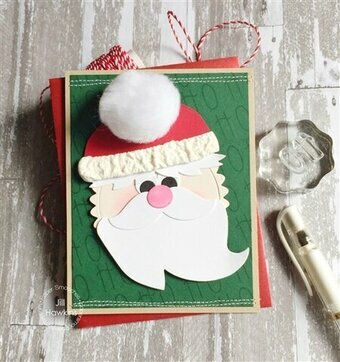 With the pieces from our Santa Face Card Maker die set, you can transform your card front into Santa Claus. The pieces include a beard (fun to cut from felt, or textured cardstock), Santa's hat trim, a big nose, one eye (cut it twice) and half of his moustache (cut it twice). The Santa Face is super easy to assemble and fun for all ages. This is a perfect die to make super fast cards, or cut out the pieces and have your kids or grandkids assemble hilarious cards for their friends without any fuss. This package contains Snowflake Fold-A-Long Card: a set of 5 metal dies measuring between 1.375x1.375 inches and 5.625x4.25 inches. Designer: Jen Long.